Lancaster City Council candidates (Top row L to R): Jordan Campbell, Sheldon Carter, Marvin Crist, Johnathon Ervin. 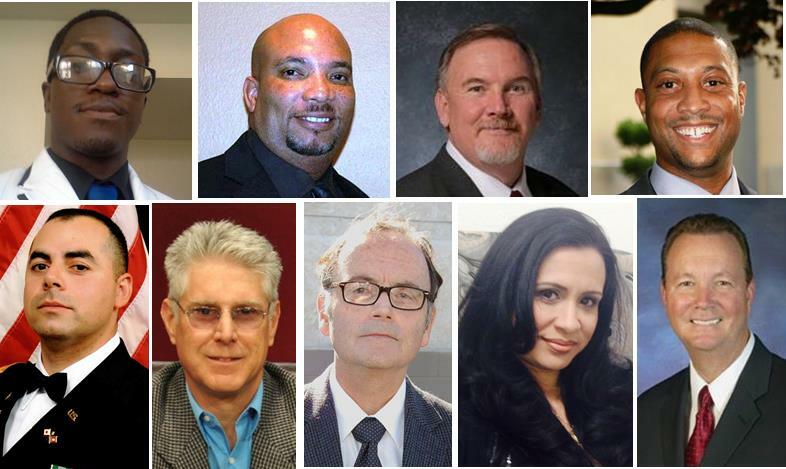 (Bottom row L to R) Oscar Mejia, David Paul, Michael Rives, Liza Rodriguez, Ron Smith. LANCASTER – The City of Lancaster will mail out the sample ballots tomorrow for its upcoming General Municipal Election, which takes place on Tuesday, April 8, 2014. View the sample ballot here. The sample ballot contains polling locations, candidate statements, important dates to remember, and a Vote-by-Mail Application. Vote-by-Mail Applications must be returned to the Lancaster City Clerk Department by Tuesday, April 1. Vote-by-Mail ballots will be mailed out to permanent Vote-by-Mail voters and those requesting Vote-by-Mail ballots beginning March 10. Nine candidates are vying for two seats on the Lancaster City Council. This year’s election takes place Tuesday, April 8, with polling locations opening at 7 a.m. and closing at 8 p.m. Vote-by-Mail Ballots must be received by 8 p.m. on Tuesday, April 8, as postmarks by that date alone will not be accepted. The last day to register to vote in Lancaster’s 2014 General Municipal Election is March 24. For more information regarding the City’s upcoming election, contact the Lancaster City Clerk Department at 661-723-6020. 29 comments for "Sample ballots for Lancaster election to be mailed March 4"
Do your civic duty people and get out and vote! Rex has really been hammering Johnathan Ervin on Facebook about his military service. Does anyone know which branch of the military Rex served in? Seriously, Rex is paying Johnathan Ervin the biggest compliment of all: he put a hit mailer out on him. That means that he’s scared, and that tells me that three of the middle-aged white businessowners on the Council don’t want the black service member sitting next to them on the dais. Better attack, attack, attack! how has rex served his country? by bringing communist chinese here to where our most sensitive military projects are developed? to offer cheap citizenship to a communist country under the guise of birth tourism? what branch of the military service did rex serve? he can’t even stomach going to a veterans parade. johnathan ervins worst day of service is light years better than rex’s best day. Maybe Rex should tell us about his military service. Oh wait. He never was in the service. Wasn’t Rex busy using and selling at the age same ages Johnathon served in the Air Force? Yeah, but, it says “In God We Trust” behind him at the council meetings, so he is safe wrapping himself in the Bible, the flag, and a billion dollars in settlements. It God great or what? Just because someone wraps themselves in a Bible, sits below slogan or has a special seat a a large, politically connected church does not make them a Person of Faith. Nor more than if I walk into Burger King, put a wrapper on my head and eat a Whopper makes me a hamburger or fast food devotee. Faith without works is dead. “Love your neighbor as yourself”, “Thou shalt not bear false witness against your neighbor”, “by this everyone will know that you are my disciples, if you love one another”, et. al are all pretty basic concepts. Exactly. The only ‘gods’ he prays to have their faces on our currency. No, Raymond Perris did not serve his country. He does although serve his self-interests. I wish to just leave a Comment expressing my hope for a high Voter Turnout. Though the thought is to hope for the best and hope that I win. I am more concerned about the community decision to even vote for who they believe deserves to be upon the City Council and who they believe will speak with their interests in mind. MASS COMMUNICATION. GOT MONEY. IT HELPS. Jordan, you are a breath of fresh air in an otherwise stale election. You actually want to serve the people of Lancaster because you love your community. Be very careful, though. If you start to get a following of any kind, they will attempt to co-opt you into their group. If you refuse, you will find yourself being marginalized and whispered about very quickly. It has happened more times than I care to repeat. On the other hand, you can leverage your new-found celebrity. I think the going price to quiet a popular Democratic Party activist is a $10K donation to the charity of their choice and a seat on one of Rex’s committees. Maybe you can up the ante! Go for it! Please Come out and Vote and spread the word. Voter turnout will be the most important factor. There are a plethora of options when dealing with crime prevention and reduction and they don’t have to be costly. This is our money and we demand smart choices. Wasteful spending no more. We are going to take our city back. FOR THE PEOPLE BY THE PEOPLE! I am an Engineer, and solving complex problems is my trade and skill. Let’s regain our title of Engineering Capital of the World!! And if it never existed, let’s make that our goal. Along the way, we will promote education and small/ large businesses, and that will reduce crime and waste. etc. for years. I can serve full-time as a council member. I humbly ask for your vote on April 8th. It is my studied opinion that this candidate has been, and remains, a Parris apologist shill and is running simply to split the vote up on his behalf. There is at least one candidate that has already told a lie! Has anyone spotted comments here or in the Valley Press or elsewhere supporting Marv Crist and/or Ron Smith? There seems to be a lot of anti-Rex and anti-incumbant talk which is encouraging. But, you never know what tricks Rex & Co. are up to. Should the UN oversee the counting of the ballots, y’know, to make sure there’s no funny business? If those 2 ‘tools’ are replaced, Rex will be next. Yeah, Rob Smith a retired deputy! More like a retired court room security guard BEFORE it turned into a LA county sheriff’s department. Didn’t ‘Rhonda’ run when he was a guard when there was a disturbance? Thanks, Scott. Then, I didn’t imagine that. His term on the council has been consistent with his cowardice. Who would vote for Ron Smith at this point? Or Crist? Problem #1, it’s an off election so a lot of folks will not come out and vote. Problem #2, Crist and Smith will have the backing of Lancaster Baptist Church. The problem I see with this race is there are too many people running. Those of us who want a change in leadership will have our votes split amongst the seven challengers, while those who are satisfied with the status quo will cast their votes for the same people. I am only voting for Ervin. The only guy in the race I can trust. You beat me to it Oscar :-) I am hoping for a large turnout and I am hoping that a large portion of those voters choose to vote Sheldon Carter. Please be sure to come out and vote.